The young urban Indian is aspirational. With a humble upbringing the wants and needs of urban Indians have grown multifold. While families have turned mostly nuclear, cash flows have increased due to both partners working thereby aiding these aspirations. My friend introduced me to such an Indian couple, Mihir and Pooja Shah. Mihir is a senior manager with a multinational chartered accountancy firm, while Pooja Shah is an IT professional working with a social media company. They also have a 4-year-old daughter. The Shah couple went about their lives without any advice on financial planning till Mihir had to buy a house. He then realised his corpus had evaporated drastically over the years due to the scattered nature of his investments and lack of timely tracking of the same. Mihir and Pooja both are drawing salaries of around Rs4,50,000 per month in total. They recently bought a residential property for which they are paying an EMI of Rs1,00,000 per month. They are also currently servicing Rs25,000 monthy EMI for their car loan. Their daughter shall start her schooling next year. All the savings that had been accumulated have been utilised by them while buying a house. The monthly investible surplus after meeting all the expenses comes to Rs1,50,000. Since they have extinguished all their investments the first objective that should be achieved would be have an emergency corpus. Typically an emergency corpus should cover household expenses of six months. In the above case the household expenses total to around Rs60,000 per month. Keeping this aside, it is also important to save a corpus for medical emergency of roughly around Rs3 lakh. The total amount of Rs6 lakh should be parked in liquid funds which will fetch decent returns, more than what is offered by savings bank account. We arrived at a safe figure of Rs1.5 crore for an important contingent liability, which shall materialise around 20 years down the line, for both the above needs considering the higher education might be pursued abroad. Doing a backward calculation it would be important for them to include a Rs30,000 monthly SIP in multi, large and mid cap funds. Upon discussion with Mihir it was understood that the couple enjoys traveling a lot. Upon a perusal of their past travel expense it was observed that close to Rs4 lakh on an average was spent. Also, their credit card bills showed a non-recurring or white good expenses amounting to Rs1.5 lakh per year. In order to save for this, I suggested they build a corpus of Rs80 lakh over a period of next three years. The above corpus can be accumulated by investing the money in a balance advantage fund. 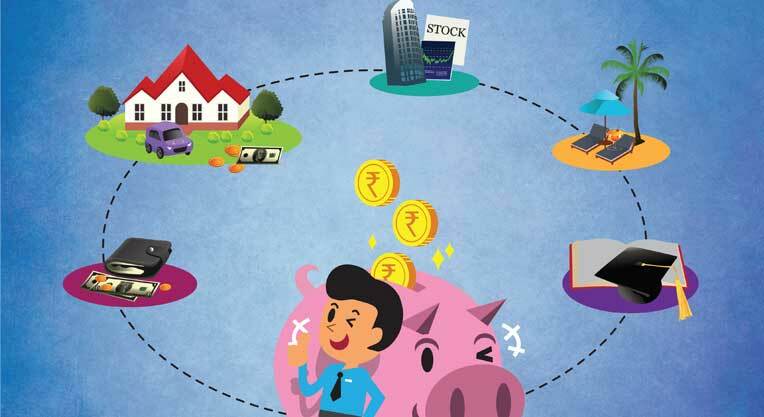 Post its accumulation, they can make a yearly systematic withdrawal plan of Rs7 lakh which shall help them meet their travel and other big expenses. The above corpus is expected to fetch a return of around eight to nine per cent post tax deduction. It was observed that both the partners were paying hefty LIC premiums for getting 80C benefits. It is advised that the money be transferred in the form of a monthly SIP of Rs12,500. This shall take care of their 80C deduction every year. For the retirement corpus, it had been decided that they would do a monthly SIP of Rs50,000 in small cap and multi cap fund with an expected return of around 13-14 per cent. This should generate a corpus of around Rs10 crore over a period of 25 years. However, every year they will increase their SIP, commonly known as SIP Top up which would be equivalent to their increase in their salaries and bonuses. Also, the amount should increase once the travel corpus is accumulated the monthly amount for retirement shall increase. While both spouses have health insurance in their respective organisation, we saw to it that a personal family medical cover for all the three members is taken, in order to provide adequate protection in the future. Both have got life insurance policies in their respective organizations and being part of the senior management have an adequate life cover. Since both the partners were working it was decided not to take a life Insurance cover. Financial Planning of the Shah family is based on the “personal opinion and experience” of Dhruv Rawani and that it should not be considered professional financial investment advice. No one should make any investment decision without first consulting his or her own financial advisor and conducting his or her own research and due diligence.